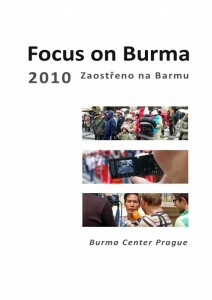 Focus on Burma 2010 is out! You may notice that this issue contains only 28 pages (including the cover). A rigidly reduced budget for this year cannot pass unseen. The front page, however, has gained some colors while the inner block remains black and white. Jaromír Marek: Where is the Burmese Media Heading? Activities and Support Provided by Burma Center Prague, o.p.s. We are happy that this year we can again offer a bilingual issue, emphasizing our local positioning and global ambitions. Please download your copy from this page. This entry was posted in buried under work, alive, project updates and tagged burmese, czech republic, Focus on Burma, journalists, media, resettlement on December 16, 2010 by Christoph Amthor.